If you know me, then you’d know that I have a weakness for pasta. I can and easily have had pasta multiple times a week, even in the same day. There’s something really comforting about it, and no matter how many times I eat it, I can never get sick of it. However, in an effort to work towards a healthier weight, I’ve started to cut back on my pasta intake. As much as I love the extra carbs, sometimes it’s nice to be a little healthy and thats where I discovered spaghetti squash. Now I know I’m not the first one to discover this delicious treat, but it’s something that’s easy to cook, it’s healthy, and you don’t get that I’m too stuffed to move feeling when you’re done eating it. There are a ton of recipes online, but we followed the sticker on the squash and it turned out just fine. Toppings can range from butter to chicken to marinara sauce. We kept it simple with butter and parmesan cheese, but the possibilities are endless. 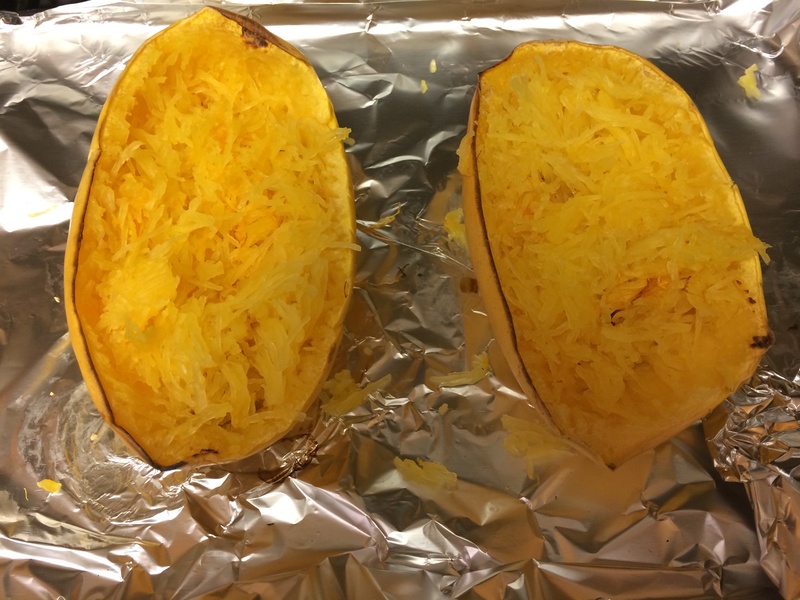 Place spaghetti squash on pan, cut side down and leave in the oven for 45 minutes. Remove from oven, flip over spaghetti squash and microwave for 7-10 minutes. Remove from microwave, scoop out desired amount and add your toppings. Spaghetti squash has easily become a staple in our home and I’m excited to try new toppings to see which we like best. I’m also looking forward to trying other squashes and expanding my cooking abilities. Have you tried spaghetti squash? Which toppings do you prefer? now i just put red sauce on kale…. – I serve chili on top of my spaghetti squash. I like the flavor combo. – Because I love the chili-like flavor combo, sometimes I mix spaghetti squash with cholula sauce and add some kidney and pinto beans to it for a quick and easy vegetarian meal. It’s also good with refried beans. Huh, I’ve been wanting to try this but never realized how easy it was. I would have to find a recipe that didn’t use a microwave though since we don’t have one. I will be trying this soon hopefully!